The variety of Sergey Katran’s artistic language incorporates mediums from poetry to total installation, and can be conditionally divided into three main areas: working with the theme of time, the theme of social mycology and the materialization of the word. This project develops the latest and shows the experience of modern media poetry, which is born in collaboration with Internet search engines - a huge field of digital word storage. 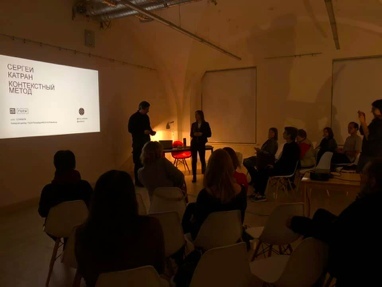 “A series of laboratory works on the topic of connectedness of language stamps and their interpretation with the help of search programs, translation software, as well as with the help of hand-written graphic studies was carried out during the residence in Kronstadt. Sergey Katran Born in 1970 in Nikopol, Dnipropetrovsk region (Ukrainian SSR, now Ukraine). He studied at the Krivoy Rog State Pedagogical Institute, Faculty of Natural Sciences, majoring in biology and chemistry. Since 1993 he has been living and working in Moscow. Since 2010 - a member of the Creative Union of Artists of Russia (section of the latest trends). Among the selected exhibitions: exhibition MMXVIII, exhibition of residents, Gallery Electrozavod, Moscow (2018), Premonition of the cosmos, NCCA-ROSIZO, Moscow (2018), Creative Machine 2, Goldsmiths, London (2018), Alpha, Beta Paradise, KCSI "Typography", Krasnodar (2017), "Until the word disappears", Gallery 21, CSI Winzavod, Moscow (2016), Panopticon, Special Project 6 of the Moscow International Biennale of Contemporary Art, (2015). Born in 1976, Alessandro Sharaffa lives and works in Turin. In artistic practice, he explores the relationship between sculpture and sound, bringing each creation to the technological limit and creating new ways to combine architecture, nature and music. The artist’s sound installations immerse the audience into a multisensory experience. Alessandro Sharaffa graduated from the Faculty of Architecture at the Polytechnic University of Turin, studied at Fondazione Spinola Banna and Stockhausen Foundation Germany, received a degree in exhibition design at Domus Academy Milan, and a degree in electronic music and sound design at MAXXI B.A.S.E (Rome). He has participated in many seminars and workshops, including the Bann Spinola Foundation for Contemporary Art and the Karlheinz Stockhausen Foundation. Together with Luca Congedo and Fabrizio Rosso, he created the experimental musical group WHYOFF. The personal exhibition of Alessandro Sharaffa “Winter Symphony” was prepared at the NCCA residence and was held at the Hermitage's Younger Center from January 30th to February 3, 2019. A new work by Kirill Garshin, made in a residence in Kronstadt, continues the series “Night animals", which was launched in Kirill's hometown, Voronezh, and explores the feeling of insecurity in the modern world. “The work created in Kronstadt continues the new series of watercolors, the main theme of which is the reflection on time. Some sense of general disorientation and anxious expectation of the future. Night winter forest, wild and impassable, where there are no clear directions and guidelines, as a metaphor for changeable and unexplored forthcoming, where potential danger lurks. Creatures that were there - people and domestic animals, as something fragile and tender. The work done in the residence captures certain elements of nature taken from photographic materials taken on Kotlin Island” K. Garshin. Kirill Garshin was born in 1990 in Voronezh. In 2005, he graduated from the Voronezh Art School with a degree in artist-pedagogue. From 2007 to 2009 he was engaged in print graphics. Member of the international residence LIA Leipzig International Art Program (Leipzig, 2013). Among his personal exhibitions are: “The Limits of Adequacy” (Kh.L.A. Gallery Gallery, Voronezh, 2011), “Wild People” (Kh.L.A. Gallery Gallery, Voronezh, 2012), “Inside the Thorax” (Exhibition Hall ROSIZO, Moscow, 2014). His group exhibitions include: Revisiting the Space Voronezh (Voronezh Center for Contemporary Art, 2013), Space LAB (LIA, Leipzig, 2013), MitOst Festival (Leipzig, 2013), 4th Moscow International Biennale of Young Art (2014), Transmission ( Gallery "Triumph", Moscow, 2015), "In the glorious city of Voronezh" (Center for Contemporary Art "VINZAVOD", Moscow, 2016), "Garden of eating snails" (Pechersky Gallery Gallery, Moscow, 2017) and others. Lives and works in Moscow and Voronezh. Jengsu Lim is an artist from South Korea. Works in the genre of multimedia installations, performance and video. "My works touch upon the theme of the artificial urban environment, materials, structures of the modern city. I create works based on the practice of peering and experiencing. Many of my works are reflections on memories, architecture, with references to product design, interior design and scenography of the city. " Jengsu Lim was born in 1988 in Seoul, received a Master of Fine Arts in sculpture class. Among the selected exhibitions: “Wall, Ground, Atmosphere”, Kim Chong Young Museum (Seoul, Korea) (2017), Tastehouse (Seoul, Korea), On AiR 2 | Landratsamt Tübingen (Tübingen, Germany) (2018), Performance | Zaratan (Lisbon, Portugal) (2018), Passion. continued. | Korean Cultural Center of New York (New York, US) (2018). Fiona Kemp (Australia) is a disciplinary artist, Ph.D. from the Sydney College of the Arts, University of Sydney. Fiona's work explores certain objects, images, and repetitive practices that resonate memory. Her sculptures, video works, paintings, installations and archival collections were presented at individual exhibitions and festivals: Hidden, Rookwood 2016; SWELL Sculpture Festival, Queensland 2015; Cementa 13 Contemporary Arts Festival, Kandos, NSW 2013; In Through Residency for Culture at Work, Sydney. “From an early age, we are taught, through the introduction of patterns and maps, to look at the world through an abstract representation of space. This work consists of seven patterns that seem familiar and fit together like puzzles. There is a visceral quality of color of some patterns, such as internal organs of something alive. Other parts resemble the color of the earth, sky and sea. The patterns also hold grooves and channels that allow the main surface of the grass and the rock on which they are placed to flow out "
Virginia Ruth Hilliard, media artist from Sydney (Australia). Her practice is based on experimental aesthetics and interest in the convergence of digital and analog images, as well as sound engineering. Virginia has been developing visual art in Australia since 1985, creating documentary films, including collaborations and performances with artists and artists from various disciplines: composers, sculptors, poets and writers. She is currently conducting research and practice in the field of field recording and digital video production with analog and high resolution and advanced camera support systems, including Steadicam. Julia was born in Tallinn, Estonia, lives in St. Petersburg. A graduate of the “Photography as a study” program of the FotoDepartament Information and Cultural Programs Foundation (St. Petersburg). The works were presented as part of Russian and international solo and collective exhibitions. In his work focuses on the problems of memory in rethinking the past and its place in it. The concepts of proximity and distance, the intersection in time and space, likelihood and fiction issues are topics that constantly arise in her work. Julia Borisova uses a variety of copyright techniques and styles, experiments with forms and materials, her interest lies in the conceptual side of the work. For the last few years, he has been creating his artistic statement through photobook projects. He is the author of the self-published books “Let Me Fall Again”, “Dimitri”, “About Men Soaring in the Air”, “Address”, “DOM”, “Flight to the Land”, “Far Coast”, etc. Julia Borisova, participant of Kassel Dummy Award, Fotobookfestival 2018; Festival Facts and Clarifications, Riga Photomonth, 2017; winner of the ENCONTROS DA IMAGEM Festival - Discovery Award, La Grande Photo Awards in the Fine Art Category, 2016; winner Unveil'd Photobook Award 2015; finalist of The FotoFilmic’15 Competition; Belfast Photo Festival, 2015; San Francisco International Photography Competition, 2014; Sony Word Photography Awards, 2013. Winner of the International Fine Art Photography Competition 2014 (Paris); 1st place at the International “Baltic Biennale of Photography” 2013 in the category “Art Photography”; participant Noorderlicht International Photofestival 2013 TWENTY. Meta Joanknecht works with traces of human presence. She finds abandoned and lost things that tell stories about former owners. The used objects and their fragments tell about everyday life and about the history of the place where they were found. 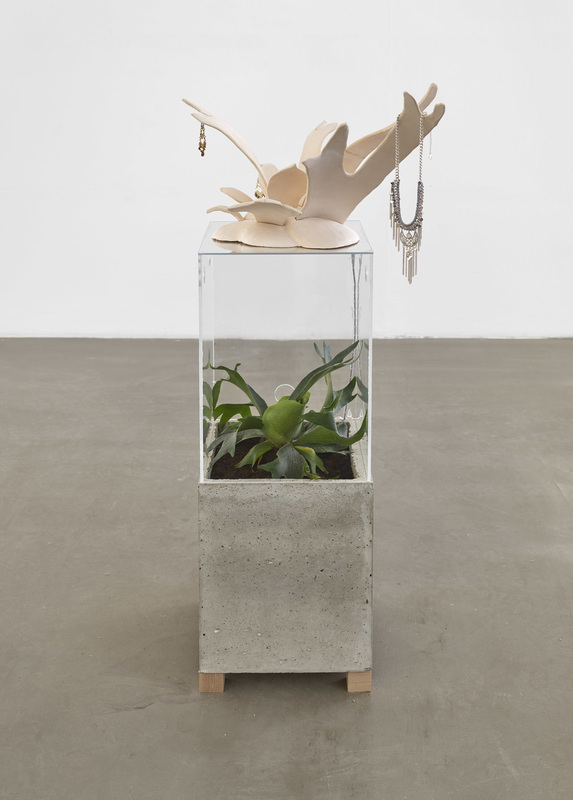 Meta collects and arranges these objects as a plan-scheme of what surrounds her. In Kronstadt, the artist will focus on transferring her own impressions of Russia through the objects she has found. Impressions are inevitably refracted through the artist’s Western thinking and will be expressed in wearable art and objects for the walls, which Meta Joannecht calls wall wall decorations. Meta was born in Ayamaru (New Guinea), studied at the Gerrit Rietveld Amsterdam Academy, lives and works in Amsterdam (Netherlands). Mark sees stories that are impossible to tell with the plot. He works as an editor, but as an artist is far from editing, he refers to the camera as a way to feel and think. Is it possible to capture the visual and auditory experience so as to truly reproduce it? Sound, spectacle, thinking for everyone is a personal and inalienable stream. Mark is looking for ways to share a personal impression with other people. Find out how the experiences and feelings of different people are interrelated, what is common in our perception. He is trying to form a language in which you can transfer your personal experience to another. The work of Mark in Kronstadt will focus on the transfer of his perception of Russian life from the point of view of Western consciousness. The sensory experience of being present is against the collection of audiovisual evidence of that presence. Mark was born, lives and works in Amsterdam (Netherlands). Dragan Vojvodic's Suprematist transmission is an artistic action with a performative structure. The artist spent it in the framework of the project, which he worked at the Art Residence of the NCCA-ROSIZO in St. Petersburg and Kronstadt in August 2018. Dragan Vojvodic works with the phenomena of body, movement, rupture, the relationship of art and society, quoting, re-reading, the study of the continuity of artistic thinking. In contrast to Kazimir Malevich’s “Suprematist Composition: White on White”, here Kronstadt becomes a canvas, the white background, and the “picture” in open space is transformed into art within the urban environment. “The Suprematist Composition: White on White” is replaced by the artist with his thought and idea about painting, and this transformation (painting) corresponds to the social one (according to the principle of opposition). Enrique Verdugo is a photographer and film director. Born in Santiago de Chile, he lives and works in London. Master of Kingston University (UK) in the field of film production. The focus of his artistic practice is the study of people and their habitats. He reflects on the changing environment and on what consequences and changes social dystopias carry. Synthesis of reality and fiction in Enrique's video and photographs is an attempt to show nature, in which the basis is the sea element. Islands in the sea Enrique sees support for a man in search of life began. Projects are born spontaneously. Enrique interacts with the landscape, using images, photos and sound. The photograph creates illusory constructions. His photographic work - the study of the image, "time and movement." The artist uses the human body as a dissolving canvas in his series “Body and Current”. In his works there is a genre variety - audiovisual installations, photographs and video shows. His films were presented at the Edinburgh Alchemy Film Festival, the Spain Alcine Festival, Les Inattendus Festival in France and many other European festivals. Sonya Belkina (1990, Moscow, Russia) lives and works in Baltimore. She studied etching and drawing at the Maryland Institute of Art (Maryland Institute College of Art), where she completed her studies and received a bachelor's degree (BFA) in 2012. She uses paints, fabrics, sculpture and computerized embroidery in combination with textile painting in her works. This year, she had an exhibition in New York, an exhibition with Dave Greber in the gallery “The Front” in New Orleans and a solo installation in an abandoned basement in Likin Park in Baltimore, which was realized with the help of the “Wildflower” gallery. The work by invitation at the NCCA is the first part of the project, in which Sonya and Dave rethink the spirituality and transhumanism of Soviet ruins and monuments in Russia and the Baltic states. Dave Greber (1982, Philadelphia) is an artist using a video-sculptural installation to formulate a mystical view of modern capitalist society. He started at New Orleans, in the group The Front, and later exhibited at the State of the Art show at Crystal Bridges, participated in Lorna Mills’s Ways of Something exhibition at the Whitney Museum of American Art, and participated in the Double Crescent show "in the C24 gallery, had a few personal shows in the Artur Roger Gallery in New Orleans. His artistic personality was manifested in his role as a pilgrim on the Apalacha Trail, a metaphysical healer in the American desert, a distillery of forest drinks in Norway, as well as a video manager for the Triennial Prospect 4 (Prospect 4 Triennial). Jacopo Valentini (1990) is a photographer, born in Modena (Italy), lives and works in Milan. After graduating from high school, he entered the Academy of Architecture, where, during his years of study, he had an internship at the Peso von Ellrichshausen architectural studio (PEZO VON ELLRICHSHAUSEN) in Chile. In 2014, he received a bachelor's degree in architecture and began working with Domus magazine (“Domus”). During this period, he fully understands the importance of the photographic environment in his life. In June 2015, he was selected to participate in the project of an art residence Photo Factory Modena in collaboration with SkyArteHD and Fondazione di Fotografia Modena. In 2016, she starts studying photography at the IUAV University in Venice under the guidance of Stefano Graziani and Angela Vettese. In 2017, he graduated, receiving two master's degrees at two universities: in the field of architecture and photography. Currently Jacopo collaborates with Italian artist - photographer Stefano Graziani, working on his own project about Pietra di Bismantova. Taya Sharafutdinova was born in 1990 in Leningrad, received a higher education in the specialty marine engineer. She studied at the faculty of photo correspondents. Yu.Halperin and in the Photo Dept. Currently a student at the School of Young Artists of the PRO ARTE Foundation. For several years working with photos and text. During her work at the Art Residence, the artist will try to understand how the feeling of life on the island changes, how the territory changes from an isolated one into an accessible one. She plans to work with texts, memories of people who remember the time when there were few cars in Kronstadt, when it was more difficult to get to the mainland than it is now. Anastasia Kolesnik (1995), student at Stieglitz Academy, Artistic Textiles Department, graduate of the School of Young Artist PRO ARTE. In their works, whether they are associated with objects (real, fantasy or media) or this objectless art, for the artist you need to reflect your own habitat in the usual forms for human life. Adapt your thought into space, give it volume through installation, or form into a photo or video. Creating a new object, Anastasia invites the viewer inside herself each time, to be incorporeal inside her world of this or that reflection, to transform into images or thoughts. In the Art Residence, Anastasia will work on her UNDERWATER project, in which she explores and immerses everything in water bodies. Represent the whole of Kronstadt under the sea abyss in a completely different environment. Anna Neizvestnova (Russia). Born in Moscow. She graduated from the Graphic Art Faculty of the Moscow State University of Printing. In 2011, she began active exhibition activities abroad, winner of prestigious international grants and awards from the UNESCO Foundation, the province of Florence (Italy), the public foundation of the city of Kristiansand (Norway), the Trust and Mutual Understanding Foundation (USA), the Pilsen artistic organization - Cultural Capital of 2015, KNW organizations (Germany). Solo exhibitions were held in Russia, Iceland, India, Norway, Italy, Germany, Estonia, Romania, USA. Having received the education of the artist of the book explores the possibilities of representation of the text. In the Art-residence, the artist worked in the project "Stories of everyday life." The project addresses the topic of memory and everyday life. The artist places projections on the darkened external end walls of the buildings of the art residence and the Museum of the History of Kronstadt, projections, stylized shadows from photographs from the personal archives of the inhabitants of Kronstadt provided by the Museum. The project uses photographs from the period of the 1960-1980s, thus the author addresses the topic of the past, which could still be remembered by the residents of the city. The characters of Anna Neizvestnova are anonymous and can be recognized at the same time, thereby showing that every resident of the city can be a hero of everyday history. The opening of the project took place within the framework of the international action “Night of the Museums” on May 19 at the Museum of Kronstadt History. Mikhail Ptitsyn (1980) was born in the city of Arzamas, Nizhny Novgorod region. Currently lives in Moscow. Engaged in interdisciplinary artistic practices: sculpture, pinhole photography, graphics, poetry performances. Mikhail's works participated in exhibitions in St. Petersburg and Moscow: “Stolen Art” (Zverev Center, Moscow), “Rehearsal of Pleasures and Other States” (Regina Gallery, Moscow), “Richterfest” (Science and Art, Moscow), III Photo Biennale modern photography (Russian Museum, St. Petersburg), "Gaidar's Black Soap" (Writer, St. Petersburg), etc. For the last time, Mikhail has been exploring the life of his “bio-models”, placing the half-dead and half-dead objects he created in the living and living environment of his own laboratory at home. The artist is puzzled by the question: what is his life surrounded by the pop machine of joy and how does death manifest itself in the universal happiness of daily consumption of information and public goods, what kind of strange matter is he himself, as a representative of the kind of "man", what is flesh how the tragedy of the body manifests itself in the universal carnival of the circus of living and dead creatures and what is such a void. All these questions find their expression in pinhole photos, graphics and poetic performances by Mikhail Ptitsyn. Ksenia Galkina (1988) was born in Krasnoyarsk, graduated from the Faculty of Journalism of the Federal Siberian University, in 2016 she graduated from the school named. Rodchenko. Lives in Moscow. The artist works with the theme of the possible immaterial human existence, with which, among other things, connects zeroing of space and action. Turning to the medium of video and the form of interactive installations, the artist exposes herself and others into a hologram, into a set of intangible ray points, casting doubt on the need for a mediated existence for knowledge. Rethinking the daily human rituals leading to the formation of various social concepts, performing the act of abandoning the human body, Ksenia Galkina fixes the existence of a new kind of life reforming cognitiveness. Projects Xenia participated in many Russian and international exhibitions, festivals and awards: the short list of prizes in the field of contemporary art. Kuryokhin in the category “best media object” (St. Petersburg), the 5th International Youth Biennale (Moscow), a special program of the International Cannes Video Festival (Moscow), the Screen and Media Arts Festival (Krasnoyarsk), the 6th Moscow Biennale (Moscow), Takeoff (VDNH, Moscow), The Wrong International Festival of Digital Art, Video Format (St. Petersburg), Cyberfest11 (New York, St. Petersburg), Tate Exchange (London). Vyacheslav Nesterov (1989) was born in the city of Perm. In 2010 he graduated from the school of design. In 2012, he graduated from Perm State National Research University and became a specialist in the Theory of Human Capital. He wrote a number of articles in the field of marketing in the field of art and research in the field of cultural capital management. He was engaged in academic painting and studied at the Ural branch of RAZhViZ. Since 2012 he has been engaged in illustration. Over time, the vector moves, experiments with new technologies and materials continue. Vyacheslav works with filaments and geometry in space, with light effects and reflections, with digital graphics and video installations, using software modeling. Sophie Dloussky is a 28-year-old French filmmaker. She was born in Marseille and currently lives in Nice. Sophie studied art in Montpellier, France, and cinema in Lausanne and Geneva, Switzerland. She finished her studies in 2017. Her work is between video art and cinema. Now Sophie working on a documentary series on contemporary Russia. Her grandparents are Russian immigrants. Her grandmother used to talk constantly about Russia when she was alive. Now, Sophie wants to go by herself in and out Russia to film and create her own memories and get to know, after all, through many different contexts, about what is today’s Russia. That is the project she will be working on in the residency. She will mainly film on the island of Kronstadt since it is where her grandfather was born. Evgeny Glushen (born in 1988) is a photographer from Minsk. Studies alternative photo processes and experiments with them. Evgeny has been working with analog photography since 2007, he completed a full course of photography at ZAO Vilia (Minsk, Belarus) and a course on studio photography at Studio 67 (Minsk, Belarus). The works of the photographer were exhibited at many international exhibitions of pinhole photography: “PINHOLEKON” (Russia, St. Petersburg); “JUST PINHOLE” at the Center for Contemporary Arts (Minsk, Belarus); "GAME IN THE CLASSIC"
(Minsk - Grodno - Vilnius, Belarus - Lithuania). The choice in favor of analog manual processes, among which work not only with a film, but also with glass plates, in many respects reveals the author’s attitude to photography and his artistic view: through alchemy of photographic processes, Evgeny Glushen captures not only light, but also the moment . Olya Dubatova (1983) is an artist, born in the USSR, lives and works in California and New York (USA). Olya explores issues related to language, technology, time, place, sound and identity. Works in the genres of painting, sound, performance, sound sculpture and video installation. Co-founder and supervisor of the BlenderLabs research laboratory at the University of Southern California (Los Angeles), which was awarded the prestigious Visions and Voices grant in 2016. Recent projects with such institutions as UC Berkeley, Stanford, USC, UCLA, Internet Archive were widely covered in the media. Oli's works have been exhibited in numerous galleries and museums of international level, including the Berkeley Museum and the Pacific Film Archive, the Aldobrandini Museum (Rome). In the Art Residence, Olya will work on two video installations together with St. Petersburg curator Maria Kharitonova. In these works, she will continue to explore the sound in its different aspects, asking the following questions: what unites people? How does emotional resonance emit messages from person to person? How do technologies improve and change the fundamental human skill to form communities through communication? Claudia Austin (Alabama, USA) - artist, doctoral candidate at the University of West Florida. Received a Bachelor of Fine Arts from Watkins College of Art, Design and Cinema. She holds a master's degree in digital media from the Rhode Island School of Design. Jackson Knicks is an artist, a researcher currently living in the Gulf of Mexico. Jackson received a bachelor's degree from the University of Alabama. The joint artistic practice of Claudia Austin and Jackson Nicks is built on a thorough study of the history of specific places and the complexity of these landscapes. Through accurate research practice, artists develop narratives that combine historical, modern, and imagined versions of carefully selected sites. While working in the residence, they will present drawings, sculptures, videos and artifacts in the same space, thereby developing a tactile, sensory experience, creating a physical level of support for the landscape, which refers to the geographical origin of each element. Kristina Paabus (1976) born in Estonia, lives and works in Estonia and the USA. Bachelor of Fine Arts (Rhode Island School of Design) and Master of Fine Arts (Chicago Institute of Arts). She studied art and religious studies at the University of Massachusetts-Amherst and was published in the Estonian Academy of Arts. Christina's artworks were held in the United States and Europe, including in Dallas, Iowa, Detroit, Minneapolis, Chicago, Milwaukee, Reykjavik, Miami, Berlin and Tallinn. Paabus has won numerous grants and scholarships (Fullbright in Estonia, University of Iowa; Illinois State Council of Arts, Research Department, Oberlin College). Participant of art residences around the world: Women's Studio Workshop (art school in New York), art residence ACRE (Steuben, Wisconsin), Kimmel Harding Nelson (Nebraska), Lillstreet (Illinois), SÍM (Iceland), MUHU AI ( Estonia) and many others. Paabus is an assistant professor at Oberlin College and previously taught at the Art School of the Institute of Chicago. In the art residence of Kronstadt, Christina is going to make a series of multimedia drawings based on the environment and historical urban experience. The particular interest of the artist is the architecture of the city, which is largely related to the naval theme. Donato Piccolo (1976), a multimedia artist, lives and works in Rome. Participant of the 52nd and 54th Venice Biennale, exhibited in important museums in Italy, Europe and the USA: MACRO, Rome / Giorgio Cheni Foundation, Venice (Italy) / Luciano Benetton Collection, Torino (Italy) / Charity Organization in Senlis (France) / Galleria Civica, Modena (Italy) / Museum in Brussels (Boghossian Foundation) (Belgium) / Beyond Museum, Seoul / George Kolbe Museum, Berlin (Germany) / ISCP, New York (USA) / SMart, Shanghai (China). In his work, the artist transforms physical phenomena into a work of art, offering the viewer a new emotional experience of nature as an object of art. With the help of high-tech tools, he combines graphics, painting, kinetics, physics, optics and programming in large-scale installations. Donato analyzes the cognitive abilities and insightful aspects of the natural world. Works from the residence will be part of the educational program, under which the artist will give a master class “Thinking about the Unthinkable”. The exhibition and master class will be held in the Youth Educational Center of the State Hermitage Museum (St. Petersburg) and will be devoted to the relationship between art and science. Stephen m Kent (1985) graduated from the University of Pennsylvania (Bachelor of Fine Arts) and the Cranbrook Academy of the Arts in Detroit (Master's degree). He studied at Haystack Mountain School of Crafts in Maine. Member of the International Ceramic Research Center Guldagergaard in Denmark and a fellow at the Oxford School of Art and Art Residence in Michigan. In 2013, Stephen moved to Berlin, where he continued to work on the study of cultural codes embedded in the subjects of everyday life. Recently, Stephen held a solo exhibition at the Elephant Kunsthall in Lillehammer (Norway), and an exhibition at the Philipp Haverkampf Galerie (Berlin). Sophie Erlund (1978) is a danish born artist living and working in Berlin. She researches architecture as a synonym for the human body and mind, creating sculptures, installations and complex soundscapes, which deal with the central theme of transition and understanding the world through the irrational mind. 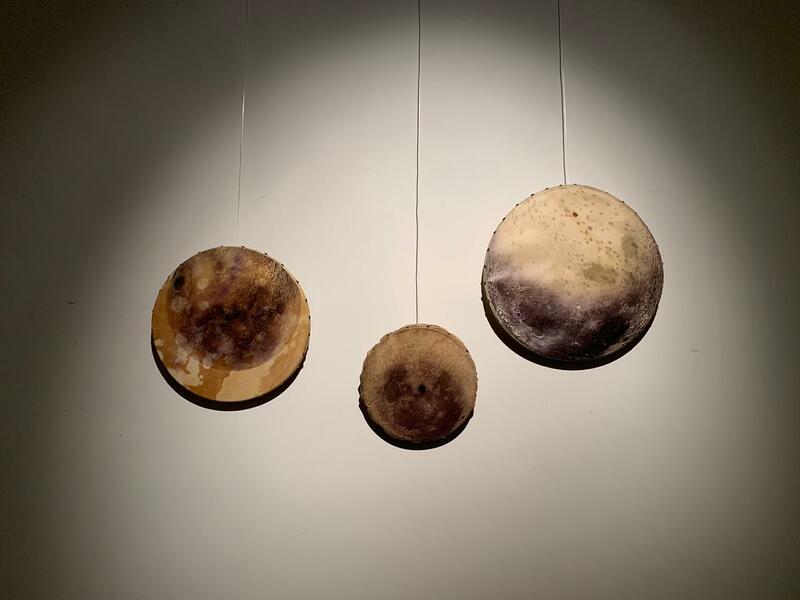 Sophie Erlund’s work has been exhibited in galleries and institutions across Europe and the US since receiving her BA Fine Art degree with honors from Central St. Martins College of Art and Design, London (UK) in 2003. During their stay in the Kronstadt residence, Stephen and Sophie are going to explore the city, collecting images of everyday objects that correspond to the ordinary language of the surrounding culture. This process of accumulating a visual index will be used in a future project to convert reproductions of everyday objects into a new artistic language. Dietrich Meyer (1987) Born in the suburbs of Washington, DC, USA. Works in sculpture, objects, drawing and video. He has been working in Philadelphia, Pennsylvania for the last 10 years, being a co-founder of High Tide, which is located in the northern part of Philadelphia. Dietrich's work is devoted to ideas about materiality in class and social structures, as well as human interaction with the natural world. In the art-residence in Kronstadt, Dietrich plans to work on an artist-book. The result of his work should be the album that Dietrich plans to publish in New York at the publishing house Bukow Press (NY, Berlin). Fyodor Dubrovin is a painter. He graduated from the Department of Easel Painting of Cheboksary Art College and the Faculty of Monumental and Decorative Arts of Saint Petersburg Stieglitz State Academy of Art and Design. Member of the Creative Union of Artists of Russia. Participant of international and Russian exhibitions. Dubrovin’s works are held in the collection of the Museum of Dionisy’s Frescoes and private collections. Fyodor Dubrovin won the scholarship of the Ministry of Culture of the Russian Federation in 2015. The theme of the artist's paintings will be parks of Kronstadt, St. Petersburg and its suburbs. Katharina Swoboda (b.1984, Graz, Austria). Lives and works between Hamburg, Vienna and Graz. Katharina´s work is predominantly video-based but she also works in photography, installation and performance art. She graduated from the Academy of Fine Arts in Vienna, and has been a PhD student at the transdiciplinary doctorate programme at University of Fine Arts of Hamburg since 2014. Katharina's videos have been internationally shown in selected venues in Vienna, Houston, Panamá, London, Budapest and Hamburg. She has received several scholarships, e.g from the Austrian Federal Ministry for Arts and Culture, and has participated in the KAMOV City of Rijeka residency in Croatia and the Nida Art Colony in Lithuania. She is member of the Golden Pixel Cooperative in Vienna. Kamen Stoyanov (b.1977) is a Bulgarian artist. Lives and works in Vienna and Sofia. Graduated from the Academy of Fine Arts in Vienna and the National Academy of Arts in Sofia. Active in video art, performance, installation art. Stoyanov’s works are interactions with the environment, reactions and comments on political and social processes. Stoyanov was the recipient of numerous grants and awards including the Austrian Federal Ministry for Arts and Culture scholarship. His works can be found in private and public collections. At the NCCA Art residence in Kronstadt artists Katharina Swoboda and Kamen Stoyanov will make together a video work that will reflect an audio-visual portrait of Kronstadt concentrating on unique landscape of this town port located on Kotlin island connected with a dam with St.Petersburg. Václav Magid – artist, critic and curator. Born in Leningrad (USSR) in 1979, lives and works in Brno and Prague (Czech Republic). Václav Magid studied at the Academy of Fine Arts and the Academy of Arts, Architecture and Design in Prague. He also graduated from the Faculty of Arts of the Charles University in Prague and is currently working on his PhD. Václav Magid is a researcher at the Academic Research Centre of the Academy of Fine Arts in Prague and teaches aesthetics and critical theory at the Faculty of Fine Arts of the Brno University of Technology. Editor-in-chief of the “Notebook for Art, Theory and Related Zones” magazine. Author of a number of articles on contemporary art theory and critics. Curator of several exhibitions of the contemporary Czech artists. His artworks are regularly exhibited in Prague, Brno and other cities of the Czech Republic. Finalist of the Jindřich Chalupecký Award (2010, 2013) and Dorothea von Stetten Art Award. Participant of the 12th Biennale de Lyon. “My method of work can be described as emphasizing contradictions and dissonance between everyday life and its aesthetic and theoretical representation. Journal notes, drawings, photographs and videos reflecting a chance meeting or a random event are a starting point for my works. I am foremost interested in the situations where little, if anything, happens. Notwithstanding, they show the ideological indirectness of our everyday experience and its determinacy by objectified concepts. I proceed from the premise that an ideology performs best at a microscopic level of ordinary practices, in the form of behavior conventionality, of a “second nature”. Using a wide range of the contemporary art media (video, installation, performance), I set these ordinary situations against visual culture stereotypes as well as fragments or philosophical texts paraphrases”. Dr Farniyaz Zaker is an Iranian-born artist. Her practice ranges from site-specific installations to video, sound and drawing. She is a Doctor of Philosophy in Fine Art at the University of Oxford. Artist currently lives and works between St.Petersburg-Russia, Tehran-Iran and London-UK. Her works have been internationally exhibited since 2002. Farniyaz Zaker was the recipient of numerous grants and awards. Her works can be found in private and public collections. Located between architectural theory and gender studies Zaker’s art practice and writing largely deal with the nexus of body, society, and place. Much of her practice explores how bodily practices and spatial awareness define our sense of identity, belonging and the very concept of knowledge. 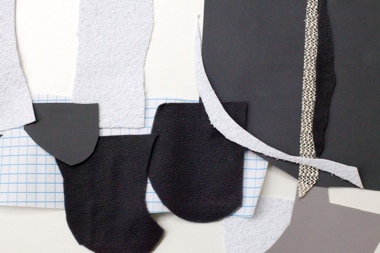 Her work is both generative and corrosive of boundaries, such as the one between architecture and clothing. It often employs transparency and opacity, repetition and memorisation, text and textiles and plays with notions of the public and the private, the physical and the psychological. In Kronstadt Art Residence Farniyaz Zaker will work mainly on a kinetic installation on the topic of the mutual relationship between subject and object, between us and our surrounding built environment, based on Martin Heidegger’s philosophy. Artists Alexandre Dang (France) and Kristiina Tuura (Finland) will take part in the 9th International Ecology and Arts Festival «KronFest». The artists will be working on their projects at the Art Residence in Kronstadt within the framework of the Year of Ecology-2017. Kristiina Tuura will create an art object of debris collected on the beaches of the Gulf of Finland. Alexandre Dang will present to the public his kinetic artwork “Dancing Solar Flowers”. KronFest is a cross-disciplinary project that unites arts and ecology. It represents an artistic approach to the issues of environment and resource efficiency and every summer brings together artists from different countries to work together on their projects in Kronstadt. Italian artist Linda Carrara will work at the Art Residence in Kronstadt on a still life series in the technique of “3D painting”. Linda Carrara received her Bachelor’s degree in the Accademia di Belle Arti di Brera (Milan, Italy) and her Master’s degree in the Royal Academy of Fine Arts (KASK) in Ghent (Belguim). Winner of the “Award TERNA– Painting” in 2015. Linda Carrara participated in various exhibitions both in Italy and abroad. She also took part in the “MOMENTUM worldwide” residence (Berlin, Germany). Linda Carrara is an Italian painter, working with different media. She is working on the topic of still-life representation for many years and tries to push this topic in a "mental direction". Connecting still life with decoration, trompe l'oeil and false marble, she is working with a dictionary that refers to painting as a subject of the work, and the represented object is just a simple excuse. On the 23rd of June 2017 Linda Carrara gave an artist-talk at the NCCA Art Residence in Kronstadt. The artist presented works created in Kronstadt and referred to the opportunities for the development of the project. Florencia Mayra Gargiulo. Prototype 2D. Wood, elastic bands. From May 2 to May 31, 2017 in the Art Residence in Kronstadt the artist from Argentina Florencia Mayra Gargiulo will work. In the focus of her project there will be found objects. The artist transforms the common objects and materials used by people to topological compositions and minimalistic sculptures, turning them into the shining crystals or signs. At the residence Florencia plans to create a light interactive installation from objects found on the island. In such a way she will express the attitude towards material culture of any place where the artist can save any subject from entropy, integrating it into a fabric of a new art statement. Florencia Mayra Gargiulo is an artist and photographer from Argentina. Active in various techniques: media, painting and street art. Photo: Giuseppe Santagata. Photographic project “A Leap into the Shadows”. From May 1 till May 30, 2017 Italian artist Giuseppe Santagata is working at the NCCA Art Residence in Kronstadt. Giuseppe Santagata’s work deals with existential issues such as vulnerability, the transience of life, and the body as a metaphor for the solitary, metaphysical quest of the soul. Stretching the limits of the physical body, Santagata tries to revise the confines of perception and create portraits that are a reflection of the mystery of the human condition. At NCCA Art Residence in Kronstadt Santagata will work on the photographic project “A Leap into the Shadows” that seeks to step into and focus on two apparently different and contradictory realities: the end and the beginning of adult life. By comparing the elderly and adolescents, the project attempts to underline the anguish and uncertainty that these two groups face with regards to their respective destinies. On the one hand, the elderly scrutinize the subtle confines between life and death, both accepting the end of a cycle and battling the idea that they might lack the time to start fresh. On the other hand, young people grapple with their desire to succeed in a reality predominated by insecurity, finding themselves powerless in the face of a foggy future. Giuseppe Santagata (b. 1979) is an Italian photographer. He received a B.A and a M.A in Law before focusing on photography. He studied Photography at the Antonio Failde School of Art and Design (EASD) in Ourense (Spain) and obtained an International Master’s in Conceptual and Artistic Photography at the School of Photography and Center for Imaging (EFTI) in Madrid. His work has been shown in exhibitions in New York, Madrid, Rome, Daegu and Valladolid and has been featured in publications such as Lens Culture, Le Journal de la Photographie and Revista Exc. On the 10th of May 2017 the Italian photographer Giuseppe Santagata met with students of the senior classes of the Children's Art School named after M.K. Anikushin in Kronstadt. The photographer told the children about the history of photography and its emergence as a separate form of art. On the 25th of May 2017 Giuseppe Santagata showed photographs from the project "A Leap into the Shadows", including new works made by him in Kronstadt, during the presentation at the NCCA Art Residence. Photo: Presentation of the project "FOUND PROJECT" by Anastasia Kizilova. Vladimir Smirnov and Constantine Sorokin Foundation, Moscow, 2017. Photographer: Evgenia Zubchenko. From April 1 till April 29, 2017, the St. Petersburg artist Anastasia Kizilova will work on the art project “FOUND PROJECT” at the NCCA Art Residence in Kronstadt. FOUND PROJECT – The project is based on a strategy that builds links within the artistic community. The basis of the project is the principle of the ideas exchange, i.e. the participants are invited to share the ideas of unrealized projects with those who are ready to be engaged in their realization. The project was launched in February 2017, and its presentation was held at the Vladimir Smirnov and Konstantin Sorokin Foundation in Moscow. Anastasia Kizilova was born in 1986 in St. Petersburg. In 2010, she graduated from the Saint Petersburg Stieglitz State Academy of Art and Design (Department of Costume Design). In 2008, she studied at FORUMAK LETO summer school (The Faculty of Liberal Arts and Sciences of the St Petersburg State University). Graduate of “School for Young Artists” of the St Petersburg PRO ARTE Foundation and “Baza” Institute (Moscow). Participant of the Russian-Finnish joint educational project of the St petersburg "School for Young Artist" and KUVA Finnish Academy of Fine Arts - "Cabinet of Curiosities" (Helsinki - St. Petersburg, 2014-2015). The FOUND PROJECT was in the short list of the Brewhouse Art Prize (2016). 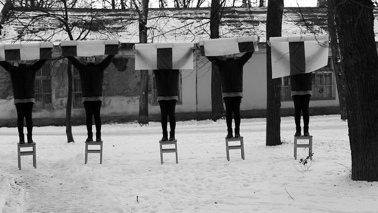 Kizilova’s project "Artist's Uniforms" was nominated for the grand prix of the Sergei Kuryokhin Art Award (2015). Anastasia Kizilova’s works are in the collection of the St Petersburg "Manege" Central Exhibition Art Hall as well as in different private collections. The association of artists "DVENEODNA" was founded in April, 2015, by artists Marina Demchenko and Alina Zakurdaeva in the Russian city of Voronezh. The association analyses questions of actuality, time, and problems of perception. Marina and Alina work with abandoned post-Soviet spaces, and produce exhibition projects with the inclusion of paintings made on the found objects, photographs, and videos. Marina Demchenko and Alina Zakurdaeva - graduates of School of Contemporary Art "LAN” (Moscow, 2016); holders of a grant of Department of Culture of the Voronezh Region and of an Award from the Voronezh Regional Government, winners of the competition "Kultpokhod", creators of the workshop "Two Windows" (Voronezh). On February 17, 2017, the opening of the exposition Heat and Waterproofing was organized at the NCCA Art Residence in Kronstadt. The artist presented objects, graphic works, and video Inside an Insulator. The artist is playing with meanings, metaphors and text, and combines her personal mythology and topography with the real story of the place and historical myths. Maria Kryuchkova (Samara, Russia) is a participant of the 9th Shiryaevo International Biennale of Contemporary Art (2016). In October, 2016 Maria had a personal exhibition "New Folder. Damaged file" in the frames of the curatorial project "Volga. Zero." Now Maria with her team is working on a theatrical project "The City of NSK", where she is engaged as a playwright and as an artist. 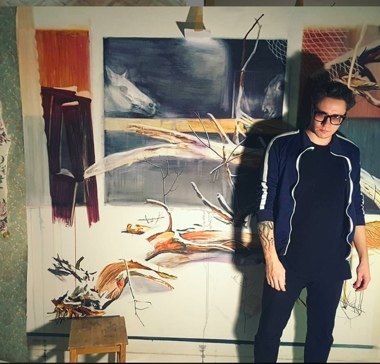 In the Art residence in Kronstadt artists Alina Kiselyova and Artyom Kiselyov are currently working on the art project "Color of the White”, a project of the human perception of boundaries of the visible world, where everyday life, in connection with futuristic design, creates surreal images and myths. White color is in tune with the northern region (white nights, the White Sea) and monochrome landscape of the area. The project represents metacontemporary space consisting of works at the intersection of painting, photography and media installation. Performance artist Abigail Donovan and engineer, inventor Thomas Hughes from the USA using a variety of electronic and optical technologies provide resonating experiential spaces, situational compositions, representing the imperfect approximations of the universe as a whole. In December 2011 at the NCCA Art residence in Kronstadt Donovan and Hughes within "The 181" art collective worked on and presented the project "Rings of the continents”. Thomas Hughes (b.1967) is an engineer and inventor. Member of "The 181" art collective. Ph.D. in Physics. He graduated from the University of Oregon and the University of Maine (USA). Areas of special interest include physics and electronics education, artistic electrical, optical, and mechanical engineering, embedded controllers and assembly programming languages. In Kronstadt Ina Otzko will prepare a video work for the exhibition "Rhetorics of Power" that will be held at the Museum of Nonconformist Art from October 15 till November 20, 2016. Julio Linares uses the traditional technique of painting on canvas. One of the reasons of the visit to St. Petersburg is his desire to investigate traditional plastic arts which, unlike in many European art schools, so perfectly preserved in St. Petersburg. His stay-program includes meetings and exchange of knowledge and experience with Russian artists, acquaintance with invaluable works of art in the Hermitage and the Russian Museum. During his stay in the residence the artist is going to paint Kronstadt landscapes which will be then exhibited in Madrid. The city of Kronstadt, with its glorious history and monuments from various historical epochs, inspires the artist by its mysteriousness and beauty. This visit is organized under the joint program of art-residences National Centre for Contemporary Arts (NCCA) and the Center for Contemporary Art Matadero in Madrid. In Kronstadt residence the artist will work on the project related to the issue of Northern Nomadism. There are several organizations and universities in St. Petersburg, researching ingenious peoples of Siberia and Far North. Research work in the archives will help the author to find new information for her project. Pim Zwier is a film maker and media artist. Graduated from Piet Zwart Institute in Rotterdam. His works balance between documentaries, experimental film and video-art. Zwier’s films and video installations were shown at different international festivals, exhibitions, and on television. Zwier was a member of Filmbank, a Dutch distributor of experimental film, also curated various film programs and was a jury member at several international film festivals. At the NCCA Art Residence in Kronstadt Pim Zwier worked on the video project “Three Dimensions of Time”. The project is a film, in which the artist uses and investigates the technology of color separation, which was once used by the Russian photographer, chemist and inventor Sergei Prokudin-Gorsky to produce color photographs. Each scene of the film is shot from the same position at three different moments of time. Three shots with filters (red, green and blue), combined together, form natural colors in all motionless elements of a picture. Simultaneously transitory elements - people, animals, machines - move through these scenes in deviant colors, leaving only a transparent trace, as if they are memories or ghosts. Since 2009 Minelli “shells” nature with colored smoke bombs, which grow in the air into mystical creatures. As an artist who came out of the protest and graffiti- art scene, Minelli decontextualizes clouds of tear gas and converts them back into the rich of color artifacts. Minelli’s artistic research has reached a high degree of synthesis and concentration that combines mastery of the aesthetic codes with language awareness and the ability to express complex content. Current series Silence / Shapes is the experiment of giving physical shape to silence. Basically, he makes such performances in the mountains, lakes, or in vacant buildings. Project is presented in the genre of photography. One more project is Padania Classics that is a landscape research project aiming to identify contemporary landscape, aesthetics and architectural specificities of ‘Padania’. Padania is a name of Piedmont, Lombardy and other northern regions of Italy. Project includes a book Atlante dei Classici Padani that Minelli has worked on for 5 years. Divided in 18 chapters this book analyzes in obsessive way subjects related to what separatist politicians call the Macro region: from urbanism based on overbuilding to the God of Gold, from waste dumping to architecture and absurd monuments, from politics to religion, from betting to ‘oriental’ massages providing a full insight about contemporary landscape and human behaviors of Northern Italy. The aim of Contradictions ongoing project (since 2007) is to point out the gap between the reality we live in and the ephemeral world of social media by writing the names of social-networks and tech companies in economically or socially unstable locations, underlining the idealization implied in the act of sharing and pointing out the difference between what we decide to show about us and how reality actually is. The marketing behind new technologies is characterized by a religious veneration, and users are pushed to live with increasing abstraction from reality, using social-media to represent only an ideal reality. For over ten years she has explored the mythology and metaphor of island sites – including Pontikinisi in Greece, Tasmania, Cockatoo Island and Wadjemup in Australia and the Isle of Wight in England. Many of the projects that have emerged from research into these locations have sought to trace out the residue of past histories. Of particular interest are the residues of fortifications around Kotlin Island. The notion of fortification as a metaphor for identity and isolationism will form the framework for initial research. McMillan’s practice often manifests as multi-channel film based installations. The use of sound and sculpture also feature. The period in Kronstadt will involve gathering moving image footage, sound and photographs that will work towards a new body of work. Since 2002 McMillan has undertaken residencies in London, Tokyo, Switzerland, Berlin, Sydney, China and Hong Kong. She has been the recipient of numerous grants including a 2015 New Work Grant from the Australia Council, which she also received in 2011 & 2009. She is also currently working on a large project called ‘The Ghosts of Material Things’ which will be shown in Berlin in 2017 for which she has received funding from the British Council and Arts Council England. In 2013 she was awarded a Fellowship from the Department of Culture and the Arts (WA) and a Mid-Career Fellowship in 2008. She has resided on the Board of the Perth Institute of Contemporary Arts (PICA), National Association for the Visual Arts (NAVA) based in Sydney and has worked as a Peer and an Advisor for the Australia Council for the Arts. Her PhD (2014) explored the capacity for Contemporary Art to unforget history. She is currently a Teaching Fellow at King’s College, London. “A Return is a research and video project that will centre around my experience of returning to St. Petersburg for the first time since I was two years old in 1989. The work will consist of experiencing the city through a series of recollections and stories that will be imparted by my mother, father, and grandparents who all lived in the city for decades. Following the traces that they set out for me I will weave a narrative of searching, negotiating memory and its complex traces on a changing landscape. The project will pose the question, what does it mean to return to a home city after so long? Making use of images and super 8 footage from our lives in St. Petersburg in the late 80's and original footage I will film in my own retracings, I will create a video and installation work which attempts to peice together these narratives into an understanding of how visual language can bridge displaced moments in time”. In Kronstadt the artist worked on an assemblage with different objects (paper, wood, cans, animals’ bones, rubbish and things destroyed by time or people, etc.) found in Kronstadt, painting them and drawing on them. Final work was presented at Kronstadt International Eco Art Festival “KronFest”. Installation “Stellar Arachnes” included stuffed animals, videos, photos, and audio. Arachne is the name of a Greek craftswoman who wanted to surpass in the art of weaving Athena herself and was turned into a spider for that. For Julien Salaud the image of Arachne is the best symbol of an Artist, who aims to connect the broken relationship between man and his environment and recreate human ecology. During the residency Karl Larsson worked on the sound project “The sound-shape of realities”. This is a project in the field of sonic relation, interpretation or representation of “music concrete” that is based not on musical, but recorded “natural” sounds. Artist records sounds and then relates them with the ones made in other places. Recordings made in Kronstadt will be edited and then reused together with recordings made in historical sites of Sweden. “Whatever the results become, there will be a touch point between history and what happens, if the history of Sweden and of Russia is mixed: the sounds are woven together and they create a space where present and past are represented in a sonic space of time”. Since 2013 Ouma is also running the SORA Project. This project is kind of art therapy. The core message is “All people have original individuality and equal value.” The participants paint on the drawings freely on A4 paper, signing them for memory. Finally all the paintings are united together into one large work. The work is growing as the number of the participants increases. About 300 people have already joined this project. In Kronstadt Ouma worked on the project “In the Cell”. The main motif of her works is “a cell”, the biologically-defined minimum unit of life. Ouma calls her art “cellular”. The patterns are automatically made on paper without any blueprints as an artist paints having no free will. A work of “cellular” art comprehends the exhibition space as a monolithic “cell”. Pyotr Shirkovsky (b. 1980) – Moscow-based artist, curator, film director. Graduated from theMoscow Institute of Architecture, the Russian State University for the Humanities, Institute of Contemporary Art (Moscow). Chief Editor of “Russian Jungles” magazine (1998). Worked at the Natural Resources Management and Environmental Protection Department of the Moscow government, Department of Cultural Heritage of Moscow, Vladimir Antonichuk Contemporary Art Foundation, the Contemporary Art Department of the State Tretyakov Gallery, and P.L. Kapitza Institute for Physical Problems RAS. Curator of exhibitions, director of documentaries “Memories of Sparrow Hills” (2005), “Pink Criminal” (2011), “Persons of Interest” (2014). At NCCA Art Residence Pyotr Shirkovsky worked on the artistic project “Springtime of Pyotr Kapitza” , an investigation based on biography of the Soviet physicist Pyotr Kapitza from 1894 till 1912. American photographer (b.1940). Visiting Professor of Practice at the Department of Cinematic Arts, University of New Mexico, USA (till 2015, now retired). Graduated from California Institute of the Arts (M.F.A., Interdisciplinary Design and Theory), Claremont Graduate University (M.F.A., Painting and Graphics). Took part in art residence programs in Ireland, USA (Colorado), Iceland. At the NCCA Art Residence in Kronstadt Junichiro Ishii worked on the artistic project "Matryoshka Horizon". From February 10 till March 10, 2016, a Japanese photographer Lisa Someda worked on “Riverside” project at the NCCA Art Residence in Kronstadt. “Riverside” is a series of photographs of the riverbank. Someda takes photographs of the opposite shores of rivers at intervals of about 50 m, joins pictures together into a one long piece and installs it mainly in public spaces. Someda has been making this series since 2004, every time changing seasons and places. In 2005 her work “Snow” was shown at the Sapporo Odori 500m Underground Walkway Gallery in Japan. In Someda’s new photo series made during the residency she reflected beautiful landscapes of Saint Petersburg and Kronstadt. During her stay at the Kronstadt residence media-artist Elena Artemenko (Moscow) worked on the Softness project (the project involved creation of an object and video documentation). “Kronstadt is a military port with numerous militartistic monuments and sites: black cannons, anchors and railings with pointed spikes, straight-back officers marching along the streets. Everything here seems to speak of military bearing and stiffness. I decided to create yet another monument that would remind of how soft and vulnerable human flesh can be. It is a silicon anchor – soft, tired and flabby – that responds to every puff of breeze blowing along the Petrovskaya embankment in Kronstadt”. PDF-version of the catalogue "Kronstadt Stories-3"
PDF-version of the catalogue "Kronstadt Stories-2"
PDF-version of the catalogue "Kronstadt Stories"